The dabbawallas of Mumbai have for decades delivered Indian home cooked meals to office workers all over the city. Their customers who for reasons of economy, hygiene and dietary restrictions or simply because they prefer hearty foods from their own kitchens rely on the dabbawallas to deliver a home-cooked meal. So what makes the idea of a tiffin service here in the United States so compelling? Well we all know that are busy lives make cooking a homestyle meal for ourselves and our family a very time consuming task especially when you factor in shopping, preparation, cook time and cleanup. We share the motivation of our fellow Mumbaites in terms of craving wholesome, healthy foods that can be delivered so easily to our doorstep. TiffinNewYork.com is one such service debuting in New York:as "New York's first professional Indian meal delivery service". 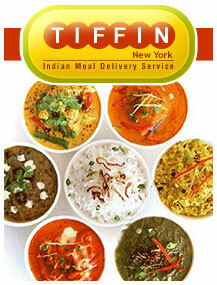 The service offers a 24/7, credit card friendly ordering facility via their website www.TiffinNewYork.com and even offers a pick up service in their facility in Long Island City, New York. The website allows you to view the week's menu in advance and schedule any number of lunches or dinners to be delivered to home or office daily or weekly – all through the convenience of the internet. While "ordering in" usually comes with the extra calories, fat and chemical ingredients not too mention all the guilt of take out, this tiffin service boasts high quality natural ingredients, fresh vegetables, and meals cooked daily all in their Dept of Health approved kitchen.